The Dividist Papers: SPOILER ALERT! How the debt ceiling "crisis" ends. SPOILER ALERT! How the debt ceiling "crisis" ends. "The only thing that provides political cover for a compromise for both sides is the dire consequences of missing the deadline. So there will be a compromise. The compromise will include some formula for revenue increases, (probably in the form eliminating deductions while reducing rates), it will include cuts to the military, and it will include deep meaningful and substantial cuts in spending in the overall budget. And the compromise will be agreed on the brink of default to no one's satisfaction. 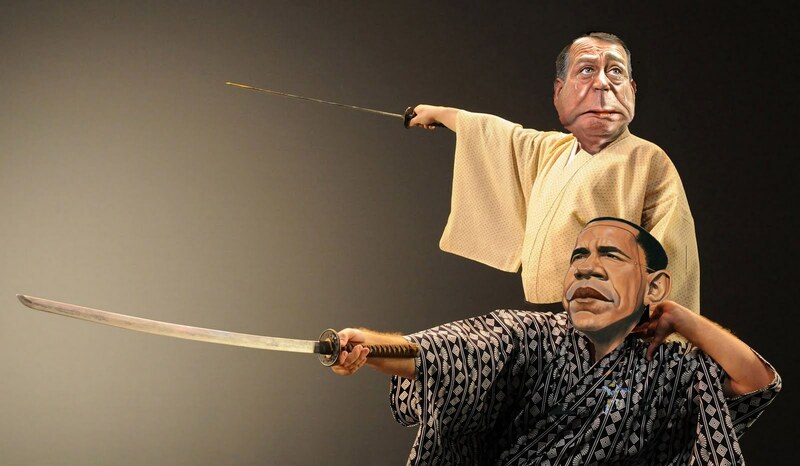 In the meantime, we have six weeks of Kabuki theater to enjoy while the eventual compromise is hammered out. Both tribes will have ample opportunity to point at the feckless hypocrisy of the other. Enjoy the show." While the Dividist is not ready to take a victory lap, he does not see any reason to change that prediction. The debt ceiling will be raised, because all leadership on both sides of the aisle say it will be raised. There is no politician of consequence in Washington who is saying otherwise. We know how this story ends. It is all about the performance that takes us there. "Now, remember that the deal Obama offered Boehner about a week ago now, or maybe a little bit less than that was $1.2 trillion in tax increases for $4 trillion in deficit reduction total. Boehner walked from that. but Boehner did say he would be okay with an $800 billion tax increase if there were $4 trillion in debt reduction total. So in some strange way, the two aren't as far apart as you would think, but they can't bridge that final gap. so now Boehner's arguing for no tax increases at all, but Obama is sort of held to that same deal and is trying to continue to offer it to Boehner." The "Grand Bargain" is still on the table. That became clear in the dueling press conference "arias" sung by the two principal actors Monday evening. Despite Harry Reid proposing a plan with no revenue increases earlier in the day, Obama ignored Reid's plan in his speech and continued to make the case for his version of the "Grand Bargain" - including revenue increases. Despite Boehner himself proposing a stop-gap measure earlier in the day - he spent most of his press conference arguing the case for his version of how the "Grand Bargain" negotiation broke down. Conclusion - they are still negotiating the big deal in earnest. Boehner is playing his supporting role exceedingly well in the shadow of Obama's scene stealing dramatics. Still - the President has an edge, successfully portraying himself to the press and most of the public as the more reasonable party in the negotiation. Last week he attempted to press this advantage to push for full $1.2 trillion in revenue increases. That was when negotiations broke down. He pressed it again on Monday with a call for public support to apply pressure in the House. Boehner played his last best move, exiting stage right, proposing a stopgap, knowing that Obama really wants the "Grand Bargain". But Obama knows that Boehner wants it too. The plot thickens. The simple fact is that the $400 billion difference is not all that significant in the context of the complete $4 trillion deficit reduction plan. These last few moves are about how that last $400 billion will be split. So far - advantage Obama - but it's not a big advantage. The Dividist predicts Boehner will move off of his $800 billion "revenue enhancement" cap, but it will stay under $1 trillion. The problem - both now and throughout the process - is that this "blink contest" negotiation cannot be settled except on the brink of a looming disaster deadline. Neither side can satisfy their constituency with the inevitable compromise. Our representatives on both sides take considerable political risk if they compromise too early - i.e. before a doomsday deadline. We've seen this every time the sides get close. Liberals and Democrats are furious at Obama and Reid. Conservatives and Republicans are furious with Boehner and McConnell. The compromise solution requires a hard deadline. The key variable determining when an agreement is reached will be when we - The People - agree whether the deadline is real and exactly when it takes place. This is part of what we heard last Friday, with both sides upping the rhetoric to make the case that the deadline was really on Monday. Nobody bought it. So we are back to the August 2 deadline, except that may not be a real deadline either. Boehner's stopgap plan moves the deadline ahead another six months. Nobody really wants that either. The Dividist continues to believe the most likely scenario is that we will get a real compromise by Monday. A suggestion: Instead of assuming that one side or the other are intransigent hypocrites, consider the possibility that both sides are arguing from principle (i.e. sincerely believing they are fighting for a position that their constituency holds dear). If you accept this framing, then it follows that both sides must maintain the posture that they are willing to walk right up to the brink of a debt ceiling default rather than compromise their principles. To do otherwise would undermine their negotiating position and be a betrayal of the people who elected them. Monday night the President said - "The American people may have voted for divided government, but they didn’t vote for a dysfunctional government." A good line, but it misses the mark. 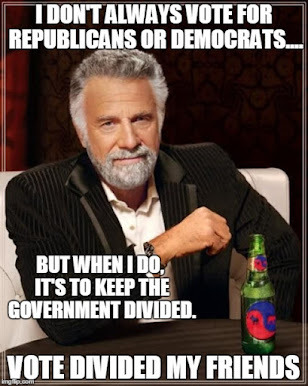 We have a divided government because we have a divided country. There is a significant faction of the electorate who would like to see our country more closely emulate a European style social welfare democracy. There is an equally significant faction of the electorate who would like to see our country move back to the more limited government concepts on which it was founded. To a large extent the Democratic and Republican politicians we elected to represent us are doing exactly what we expect of them - representing our views - just the way we want them to. Our government is not dysfunctional, it is behaving as designed to resolve conflicts between large and opposed factions in the populace. The time to worry is when the factions are not fighting each other to a standstill. That usually means the system is not working as it should and power is too concentrated. Or it means we are going to war. The Dividist's primary rationale for supporting divided government is that it leads to more fiscal responsibility and spending restraint in our federal government. The Dividist is interested in the result, not the histrionics that are necessary to get there - no matter how entertaining. The kind of giant cuts envisioned in the "Grand Bargain" can only happen when we are teetering on the brink and can only happen with a divided government. Pay attention to the result - not the performance. 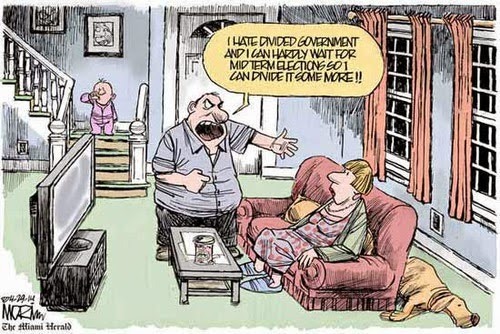 Divided government may be winning and winning big. ha. Just had a discussion with a friend about the very same thing the other day. Made a pathetic attempt at putting it into comic form. It's the second one down in the post. Enjoy. Well done. Good to know that I am not the only one thinking along these lines - "Great minds..." etc. Still, I deeply resent the fact it took me over 1200 words what you got into 4 panels. If I had written it out, it would have taken me just as long. The original insight wasn't mine, I must admit, but rather one of my blog readers, and I decided to turn it into a comic. It's always good to find a fellow discourdian out there. They seem to be the only ones who pick up on the reference . . .